Mary Rudemiller, and David Stone interview a potential scholarship student. We entered the second half of our trip with much accomplished. David Stone along with Mary Rudemiller, the new scholarship administrator, have interviewed students for 10 days. They have a solid list of high school graduates who will receive help with college fees over the next year and a half. 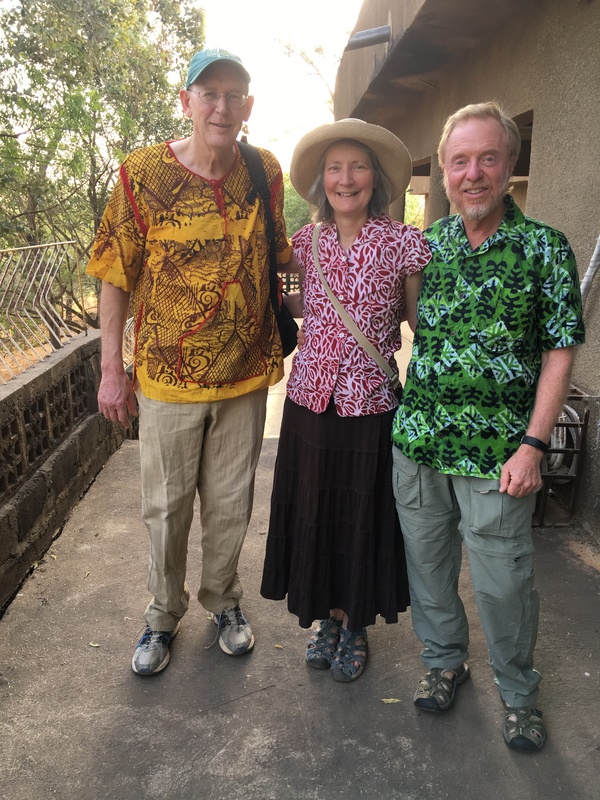 David Stone, Mary and David Rudemiller looking African! 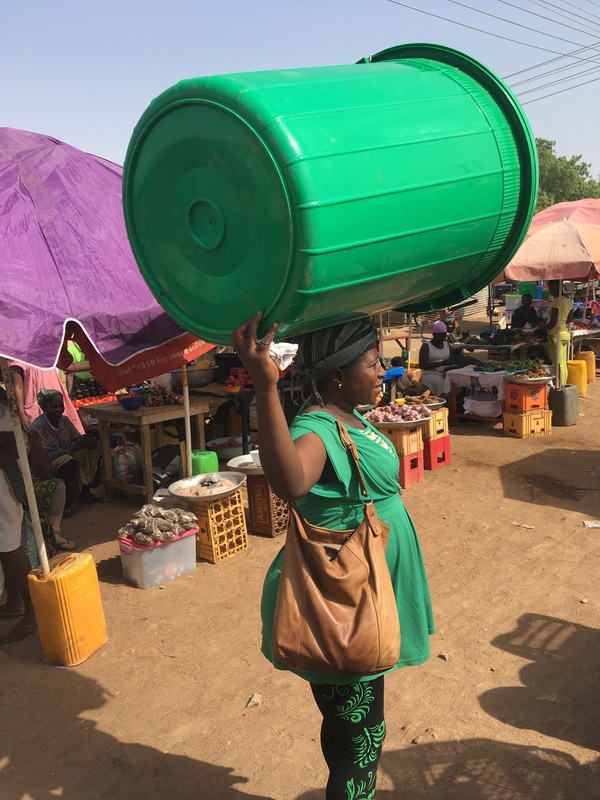 Janet provides major assistance in coordinating food availability in the Bolga market. Though 8 months pregnant, she is carrying a large water container for Piitanga School. Lisa has completed food purchases for the Nutrition Center feeding program for infants and toddlers as well as Piitanga and Zeemboug elementary school lunch programs. The cooks for all the programs have been tested (and treated if necessary) for typhoid, hepatitis, and parasites. The borehole pump mechanism has been repaired at a the new feeding site, Zeemboug Elementary. Without good access to clean water over the past few years, the rate of typhoid infection was quite high for those cooks. In another major accomplishment, desks have been ordered for the new school building in Piitanga. A local welder is building them.This year we’ve had good help from the Nabdam School District and the Health Service in transporting the food, they will also transport the new desks to Piitanga. Donors to Yakote Women Farmers have funded all of these programs. Standard cooking pot and ladle for the lunch programs. Cooking in these large pots is done over a wood fire. Back in Ghana we are first working on lunch programs and school projects. A challenging project at Zeemboug Elementary. We were contacted by the deputy director of Nabdam schools about a school well off of the main road and with multiple challenges. Because the children have far to walk before reaching another school, the government began construction of a small school building in 2013. Construction ended in 2014 with the school about 1/2 completed. In addition, the nearby borehole mechanism was broken during construction and households now walk over a mile to get water twice per day. With no idea whether the government construction would ever be completed, the community organized to build a small mud-clad building with two rooms. With this primitive building finished, the government posted several teachers to begin classes. Ninety students now attend classes in Zeemboug, many of them sit outside under a tree for their classes. Considering both the possibilities and difficulties of the situation, Lisa headed for Zeemboug on our first day here. 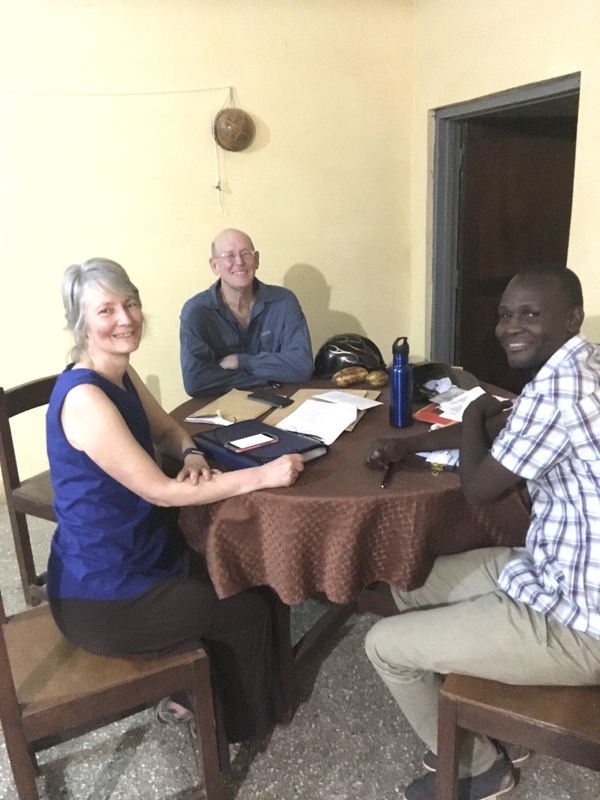 She met with the Headmaster, PTA chairman, headteacher, and student school advisory committee for the school. We decided on a three pronged approach: First to repair the borehole mechanism, once there is water to begin school feeding, attempt to contact the government about finishing the school Including an offer for Yakote Women Farmers and Framework International to complete the building, and if that fails work to get a new school building for Zeemboug. The abandoned, partially completed school building. 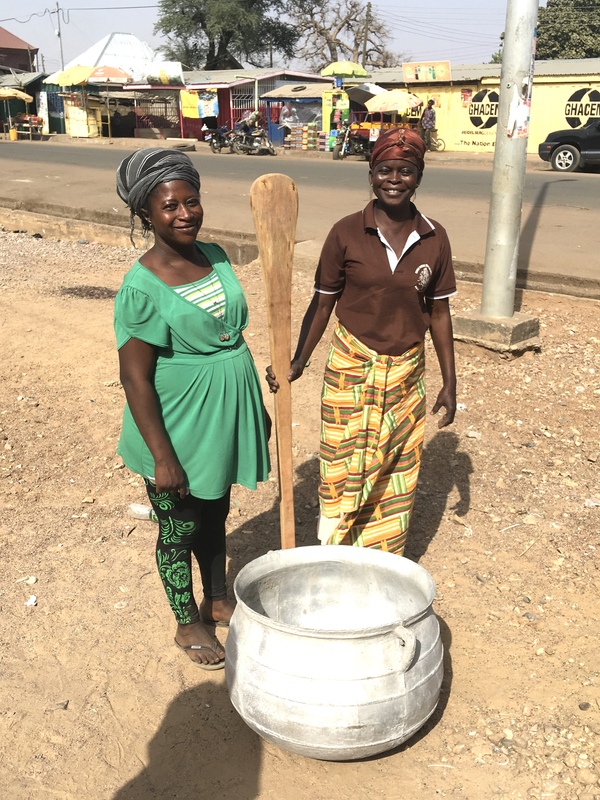 Our work with Yakote Women Farmers is in Ghana, a West African country slightly smaller geographically than Oregon, yet with 30 million people (7 times the population of Oregon). 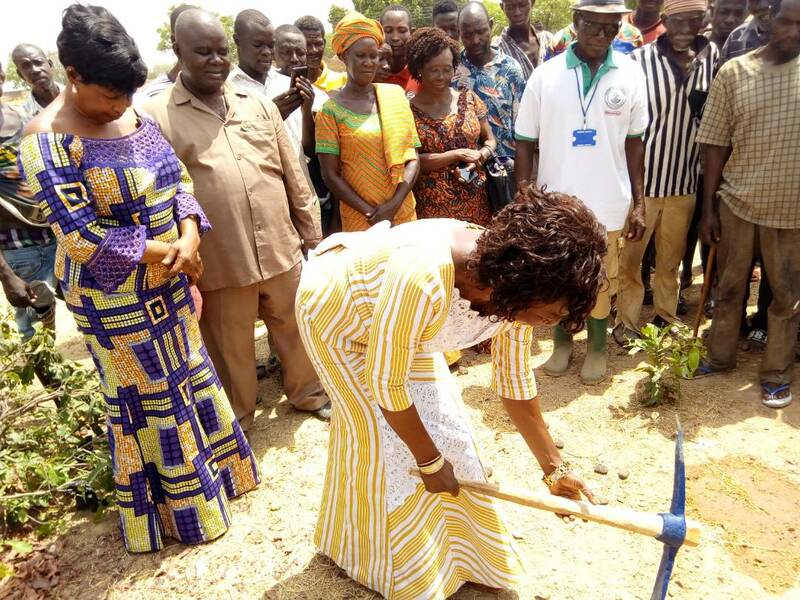 While we cannot solve the huge economic challenges of a developing country such as Ghana, we do feel that by focusing our efforts on supporting nutrition, income generation, education, and farming in the Nabdam district of northern Ghana, we are able to significantly increase opportunities and ease poverty for a large number of Ghanaians. BY PURCHASING CALENDARS, YOU ARE SUPPORTING THREE SCHOOL LUNCH PROGRAMS AND A NUTRITION CENTER FOR INFANTS AND TODDLERS. Special thanks to https://www.printingcenterusa.com for the discount on printing. THEY MAKE A TERRIFIC HOLIDAY GIFT! We invite you to watch this nine minute interview with Bill and Melinda Gates. What excellent spokespersons for the importance of reducing extreme poverty! David and I couldn’t agree more with what they have to say about Africa and the role of long term commitment to helping communities. In every phone call and every visit to Ghana we see the evidence of how far a little money goes toward big improvements in quality of life. Bill and Melinda Gates speak – Africa is not a lost cause! This photo is from Friday, April 13th. The walls are quickly being built. After several weeks of work, the community remains energized in working on the school building. A community at work – Building a new school! After the official ground-breaking for Piitanga Primary School on March 27, construction of the foundation began March 28th. Framework International (an Oregon based charitable organization) is supervising the community in work on the foundation. Yakote Women Farmers and Framework International donors have contributed to make this new school possible. The Honorable District Chief Executive does the official ground-breaking. 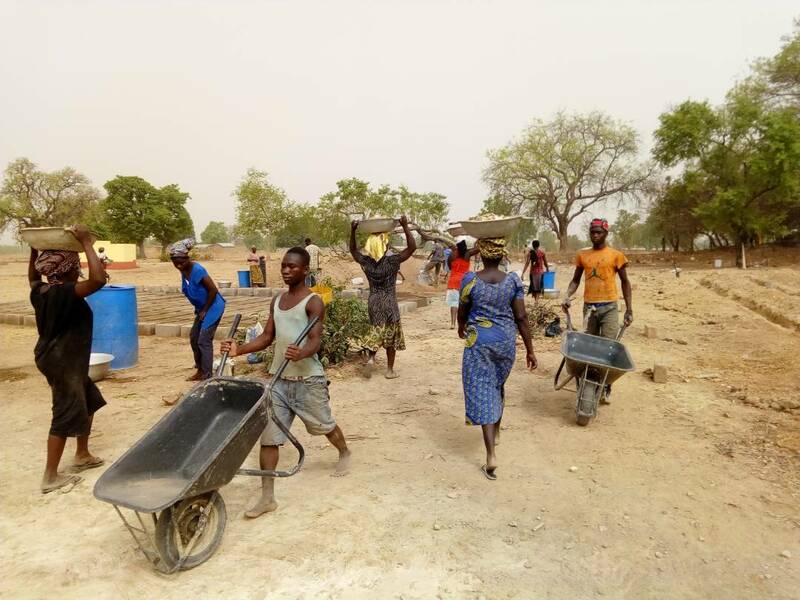 For the past week, many in the village have worked hauling sand and gravel to make cement blocks. Another agency contributing toward the new school in Piitanga is VSO (Voluntary Service Overseas). They recently completed this latrine for the students. We are so fortunate to have these charitable partners to work with on this large project. There is great news – construction of a six classroom block for Piitanga Primary will begin this March. Francis Sappaat, the deputy district director of the regional schools says this is a “dream come true” for the community of Piitanga. Our niece, Britney, worked with the community this January to set up their school lunch program. She writes the community is very dedicated to helping build the school and to the education of their children. This is only possible with the help of Seth Prickett at Framework International (also a charitable organization in Oregon). Yakote Women Farmers (our organization) will provide $15,000. Framework International is funding the remaining $35,000 for construction. The building walls will be constructed of cement blocks. Before long 5 loads of sand, 2 loads of gravel, and 500 bags of cement will be delivered and the community will begin the many days building the forms, hauling water by hand (100 yards to the nearest well), and mixing cement to make the blocks on site. this January Marilyn looked at the Piitanga Primary building site with the Headmistress, builders, and teachers. Look carefully, the kids are carrying firewood to use for cooking their lunch. The mud building is the nearly completed kitchen for Piitanga Primary School.